MINOT, N.D. (AP) — Troy Roness, an instructor of teacher education and kinesiology at Minot State University, is sharing his story about how he battled his way back from anorexia almost a decade ago. Roness wrote a book based on the journals he kept when he was in a residential treatment center for anorexia. SIOUX FALLS, S.D. (AP) — Sanford Health is expanding its research work by adding in a Fargo, North Dakota-based research institute focused on eating disorders and obesity. Sanford Research is absorbing Neuropsychiatric Research Institute. NRI was established in 1955 and previously worked with Fargo-based MeritCare Health System, which Sanford Health absorbed in a 2009 merger. MCCOMB, Miss. (AP) — The McComb School District says it's the first in the state to provide mental health counseling to students through a telehealth program with the University of Mississippi Medical Center. It's making a difference for children with problems including depression, eating disorders and attempted suicide, the district's four school nurses told the McComb Enterprise-Journal . RICHMOND, Va. (AP) — A nonprofit in Virginia is hoping to help its community with a monthly workshop on how to address youth mental health issues. The Virginia Home for Boys and Girls' website says the workshop is meant to teach attendees about the risk factors and warning signs of various mental health issues common among youths, such as depression or eating disorders. Being upfront about her sexual identity and her 10-year struggle with an eating disorder is part of what made Abigail Swetz an effective teacher — in that way, she made herself vulnerable and built trust among students, she said. Until last year, Swetz, 35, was a teacher at O’Keeffe Middle School. There, she made a difference in the lives of 60 students a year for six years, but yearned to do more. LAWRENCE, Kan. (AP) — "Why are you betraying me? Why aren't you listening?" the voice shouts. "We went so long doing this together, and we're so strong." The voice inside Zoe Prather's head gets loudest as she begins the re-feeding process. It is angry that she's undoing what anorexia has done to her body. Prather, 18, of Lawrence, said once you've had an eating disorder with you for so long, it becomes like your protector. Dear Annie: I want your readers who think they may have an eating disorder to know that they are not alone and that their condition is treatable. I am living proof! Throughout my childhood, I struggled with my weight and my relationship with food. When I reached the end of high school, I committed to being "healthy." I lost more than 50 pounds by eating better and exercising. What a feeling of power it was to have made such a big and (I thought) positive change. They were little girls with dreams of Olympic gold when they started in gymnastics. Now they're women with lifelong injuries, suffocating anxiety and debilitating eating disorders. Demi Lovato is "proud" of her "no-more-dieting thighs". The 'Confident' singer has previously battled with an eating disorder and insecurities about her body, but on Wednesday (21.02.18) she showed those days are gone as she flaunted her pins. She captioned a picture of her laying across a garden swing chair: "These are what I call no more dieting thighs and I'm proud of them #thickthighssavelives.. (sic)"
GLEN COVE, N.Y. (AP) — Some residents of a suburban New York community told a City Council public hearing on Wednesday that a residential treatment facility for people with eating disorders would depress their property values. But Newsday reports that supporters of the 14-bed group home planned for the city of Glen Cove on Long Island said the home is needed. The holidays can be a source of stress and anxiety for anyone. Whether it’s family tension, presidential election fallout or higher credit card bills, “the most wonderful time of year” is often a time of uneasiness. And those who struggle with an eating disorder face an additional layer of anxiety. The Emily Program, a national center for treating eating disorders, is dropping as many as 250 patients as it shifts its focus toward a more intensive treatment model for people with severe, dangerous conditions. The for-profit program, which is based in St. Paul and has clinics in Minnesota, Ohio, Pennsylvania and Washington, will stop providing outpatient therapy for many patients who have eating disorders but whose primary diagnosis is a mental illness, such as anxiety or depression. COLORADO SPRINGS, Colo. (AP) — Two-time U.S. women's figure skating champion Gracie Gold has withdrawn from the national championships while she continues to seek treatment for depression, anxiety and an eating disorder. Gold announced last month that she was withdrawing from her Grand Prix assignments, and her decision to skip nationals in January ends any chance of her competing at next year's Winter Olympics. Kasey, a local teen, would only talk about her problem if her real name was not used. “It grips you, and what starts off as ‘a way to manage your weight’ becomes this scary thing that you have to live with,” she said. MORRISTOWN, N.J. (AP) — A New Jersey judge cleared the way for parents to force-feed their 20-year-old anorexic daughter. The judge on Tuesday ruled the woman, known as S.A., was incapable of making her own decisions and gave her parents the power to make medical decisions on her behalf. Her lawyer had argued that she wanted to make her own decisions and that she can manage her eating disorder on her own. AURORA, Colo. (AP) — Police officers dressed as superheroes rappelled from the roof of Children's Hospital Colorado to brighten the day of the patients inside. The hospital in Aurora serves hundreds of children with different diagnoses ranging from serious trauma to dermatological illnesses, cancer and eating disorders. The officers work for the Aurora Police Department, and Tuesday's event was part of their training as a SWAT team. A black hooded sweatshirt that seems to make light of a potentially fatal eating disorder has landed retail giant Amazon in the crosshairs of consumer wrath, with horrified customers and mental health advocates demanding it be removed from the popular website. The hoodie carries a mock dictionary definition of anorexia in hot pink letters that reads: "anorexia (an-uh-rek-see-uh) like Bulimia except with self-control." Lily Collins feared her eating disorder would stop her from having children. The 28-year-old actress became anorexic and bulimic during her teenage years, and Lily has admitted the stress she was putting her body through led her to believe she may not be able to have kids of her own. She shared: "My throat burned and my oesophagus ached. My periods stopped for two years and my life was out of control. I was terrified I had ruined my chances of ever having kids." Writer-director Marti Noxon's deeply moving feature debut, "To the Bone ," isn't just about a young woman confronting anorexia; it's a story about coming to terms with the ridiculous, awkward, beautiful and painful realities of adult life. Without judging or romanticizing, Noxon presents a heartfelt and heartbreaking portrait of a 20-year-old girl trying to cope with the challenges of growing up by obsessively restricting calories. LOS ANGELES (AP) — Writer and director Marti Noxon struggled with anorexia and bulimia for 10 years. It's her story, albeit a fictionalized version, that she tells in "To The Bone," a feature film coming to Netflix on Friday about a 20-year-old artist whose eating disorder has reached a dire point. Lily Collins, who herself has a history with eating disorders, plays the main character Ellen. 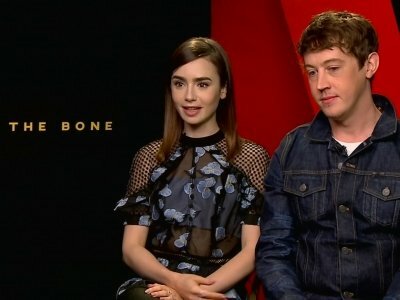 Lily Collins "felt very strongly" about appearing in 'To the Bone'. The 28-year-old actress has admitted she was very keen to star in the new drama movie, which tells the story of the 20-year-old anorexic girl, because of her own experiences of an eating disorder. Lily Collins never sought medical help for her eating disorder. The 28-year-old actress recently opened up about her struggles in her memoir 'Unfiltered' but admitted the first time she was able to share her story with others in a similar situation was when she was researching her latest movie, 'To the Bone', in which she plays an anorexia sufferer. Diane Keaton became bullimic to "fill a vast hole" in her life. The 'Annie Hall' actress was gripped by the eating disorder in her 20s and didn't even discuss the struggle with her then-partner Woody Allen. She explained: "I was trying to fill a vast hole. I had a massive appetite for ... everything. Just wanting a lot. "I can't explain it - I still don't really know why. But I will tell you why I stopped - I went into analysis with a woman five days a week because it was real bad. Melanie C developed an eating disorder because she felt she had to be "perfect" to be a pop star. The former Spice Girls singer has opened up about her struggles during her time with the girl band, admitting her problems were sparked by feeling guilty that she didn't deserve fame and wasn't a good enough singer or dancer because of cruel comments that she was the "plain one at the back that didn't really do anything". Kesha and her long-term boyfriend are reportedly planning on tying the knot. The 30-year-old musician has been dating Brad Ashenfelter for around three years, and it seems their relationship has been going from strength to strength as a source has claimed the pair are "very loved up" and has hinted at the possibility of an engagement "very soon". Troian Bellisario's eating disorder left her feeling isolated. 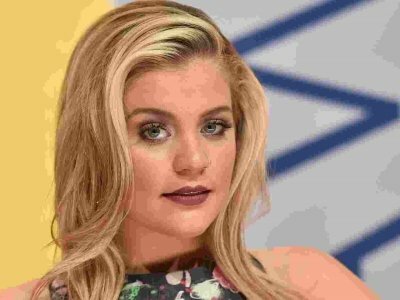 Although the 'Pretty Little Liars' star was surrounded by a loving family and supportive boyfriend, she admitted that she found it hard to cope as no one could understand what she was going through. She told Interview magazine: "I couldn't get anyone - even the people who loved me the most, even my boyfriend or my mother or my father - to understand what that experience was truly like for me. Lily Collins was "nervous" about losing weight for her new movie as she has battled an eating disorder in the past. The 28-year-old actress - who struggled with her weight as a young girl - had to drop a dress size for her role in 'To The Bone' and was "closely supervised" by producers and a nutritionist throughout filming. I nearly choked on a piece of ice from my Dunkin coffee. Harry Styles wishes he could have helped Zayn Malik deal with his eating disorder. Zayn, 24, previously admitted he developed an issue with food, which he called a "control thing", during his time in One Direction and former bandmate Harry Styles said he had no idea but would have helped if he had been aware of a problem. Philadelphia Young Playwrights' (PYP) new podcast, “Mouthful” is powered by the experiences and perspectives of students. Each week, "Mouthful" explores and dissects a different topic. From a transgender teen to a teen of color, "Mouthful" investigates identity, access, equity and inclusion. From a student with micro-agressions to a student with eating disorders, the series examines social acceptance and social intolerance. PITTSBURGH — An outfit that fits just right has the potential to empower. But the process of finding one — which often involves sorting through a dizzying sea of sizes that varies from brand to brand — can be overwhelming, particularly for someone recovering from an eating disorder. BURLINGTON, Wis. (AP) — An eating disorders bill that was championed by a Burlington man has been signed into law. The Journal Times (http://bit.ly/2gEPgGR ) reports Nathan Libbey contacted the Eating Disorders Coalition and traveled to Washington to lobby legislators after his wife, Jennifer Libbey, died in August 2014. She suffered from bulimia. NEW YORK (AP) — Since he left One Direction, Zayn has been public with his battle with anxiety. But the singer also says he was struggling with even more behind-the-scenes — a possible eating disorder. Zayn made the revelation in his new autobiography "Zayn," out Tuesday via Penguin Random House, and also discussed it in an interview with The Associated Press. Just 12 days after her wedding, Tandi Barron was placed on a feeding tube because of her struggle with an eating disorder. Not long after, she told her husband that if she was ever going to put food in her mouth again, she needed serious help. The disorder had started in college, where members of the dance team were weighed weekly and could only perform if they were under a certain weight. WASHINGTON (AP) — Even if your daughters don't pay much attention to politics, they'd be hard-pressed to have missed Donald Trump's attack of a former Miss Universe's weight or comments about a 400-pound hacker. It resonated with a 15-year-old who said this week the words damage girls' body image and asked Hillary Clinton how to help. Penn State coach James Franklin said Tuesday he's proud of kicker Joey Julius for how he's dealt with an eating disorder that kept him out of spring practice and led him to being admitted to a clinic for treatment this past summer. Julius said in a Facebook post this week that he was in therapy at McCallum Place Eating Disorder Center in St. Louis from May 9 to July 26. Some Vermont families are coming out of the shadows to shed light on an issue that is often kept a secret. The struggle with eating disorders is the focus of a new documentary called "All of Me" by Vermont producer Bess O'Brien.